Maggette Saves Bucks Season? ~ The Bucky Channel - The World of Sports from Wisconsin's Perspective. 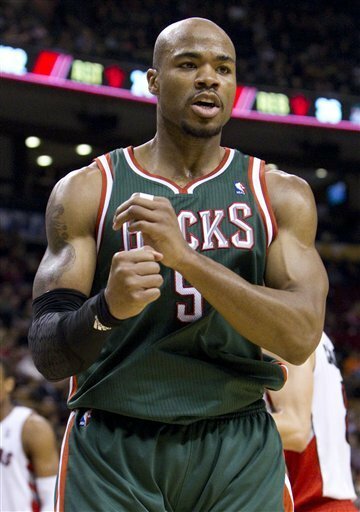 Home » Amir Johnson , Andrea Bargnani , Andrew Bogut , Carlos Delfino , Corey Maggette , Ersan Ilyasova , Milwaukee Bucks , Toronto Raptors » Maggette Saves Bucks Season? Okay, the title may be overstating things a bit, but Corey Maggette's lucky bounce off the front of the rim, off the back of the rim, and roll in three point shot in overtime saved me from giving up on these guys. The win also saved me from throwing my roommates lap top across the room, so he'll be happy for that. Maggette's suspenseful shot put the Bucks ahead for good in a 116-110 overtime win against Toronto Friday night. Milwaukee had all the chances in the world to win this one in regulation. They blew a ten point lead that they had in the first quarter, and they blew a ten point lead they had with 6:31 left in the game. I think you can tell why I was about ready to give up on this team. The first quarter was what Bucks basketball should be, because they worked the offense through Andrew Bogut. On the defensive end they hustled, and forced the Raptors into bad shots. It was like they came out with energy carried over from the fourth quarter on Wednesday against Atlanta. Bogut should have went for 40 points on Friday, because he had at least 12 points after the first quarter. But the second quarter was back to what we are used to seeing from this Bucks team. Milwaukee let the Raptors right back into this one when Toronto started the second quarter on a 10-0 run. Then when the starters came back on the court Milwaukee didn't really go back to working the offense through Bogut. He was really shut down the rest of regulation. He had 18 points at the end of regulation, and like I said he had at least 12 of those in the first quarter. In overtime though Milwaukee went back to what was working early, and Bogut scored the first six points of the extra period. That gave the Bucks a six point lead early, before the Raptors called timeout. They took Bargnani off Bogut, and stuck Amir Johnson on him. That new look from Toronto confused the Bucks a big, and they gave up that six point lead they had. Then with 44 seconds left Maggette made a very lucky, but huge three point shot to give the Bucks the lead. After that they played strong on defense, and made the free throws needed to escape with victory. Six different Bucks scored in double figures on Friday night. All five starters plus Delfino off the bench gave the Bucks a steady offense. Corey Maggette was the team leader with 11 rebounds, while Carlos Delfino lead the way with 6 assists as he was playing point guard most of the second half. Milwaukee shot 55.3% from the field, and Maggette also led the way in scoring with 29. Ilyasova tied a career high with 25 points, before fouling out in regulation. Clearly, it wasn't a very pretty game by the Bucks, but they got one they needed to win badly. It would be nice to be back in the 8th seed spot around All-Star break to kind of build some confidence. One key to that could be the return of Brandon Jennings, who is expected to return Saturday night against the Nets. Playing the Nets should be another win for the Bucks, but we'll see. Even though the Bucks are eight games under .500 with a 18-26 record, they are still just five games out of the 6th seed. That team they are chasing would be the New York Knickerbockers, and they have some injuries of their own to deal with right now. So the Bucks are looking to make it a three game winning streak with a victory over the soon-to-be Brooklyn Nets. Game is on FSN at 7:30 Central time, but games never start on time at the Bradley Center. So maybe plan for like 7:40 or so. Just looking out for you, Bucks fans.